•Paths are slippery at this time. Clear away fallen leaves as you may slip if conditions are wet. If moss makes paths slippery, water on Brintons patio cleaner diluted in water to kill the moss. After watering the path, leave the solution for about an hour before brushing off the moss with a stiff broom. •Our lawns are very wet. It would be wise to insert a garden fork into the turf to the full depth of the prongs. 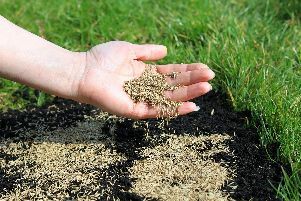 Then scatter sharp sand over the lawn’s surface. Brush gently into the grass. This will prevent slipping when walking on the grass. •Thank goodness the leaves have fallen. It’s been a mammoth task picking them up. If you haven’t done this, rake them so the wind is blowing towards the heap you are building. Once there is enough, grab them and put into large old potting compost bags so they will rot and become leaf mould. Sprinkle on one part urine to seven parts water – the best activator and it’s free! •At the allotment, because of the wet weather, some of the Brussels sprout buttons look as if they have rotted. Leave those which still look a bit green because after Christmas they will burst open to form what looks like little cabbages. It’s a bit fiddly preparing them in the kitchen but these can be very useful to eat and the leaves taste as good as spring cabbage. •If you enjoy growing lettuce in a cold greenhouse, another batch of winter lettuce can be sown now for harvesting in March. Look for the variety Rosetta, produced by Suttons seeds.